Is this what happened to the Langholm harriers? Is this what happened to this year’s Langholm harrier chicks, Barry and Blae? (Blae confirmed dead, Barry now ‘missing’ – see this morning’s blog entry below). These photos were taken on Moy Estate in 2010. Naturally, nobody was charged with these offences. Probably not enough “hard evidence”, eh? One gamekeeper (James Rolfe) was charged with possession of a dead red kite that was found in the back of his vehicle. The kite had two broken legs and its head had been caved in with a blunt instrument (see here and here for background info). Thanks to the contributor who sent in these images. This dead eagle was found on a Scottish grouse moor in 2010. Tests showed it had been poisoned with a banned pesticide. Nobody has been charged. It seems that unless the poisoner is actually seen placing the bait AND unless the eagle is actually seen eating from that bait (how unlikely is that?!) a prosecution will not be forthcoming. We know from experience that even with filmed evidence of illegal activities a prosecution is not guaranteed. This ludicrous situation sends a clear message to the poisoners: carry on, you are immune from prosecution. “Given the appalling news story about a golden eagle found with injuries from a leg-hold trap…here’s my photo of a freshly used gin trap and stake seized by the police and RSPB from a keeper in 2003. One of a bagful. To my certain knowledge these traps, outlawed finally in Scotland in 1974 (20 years after England…seems it was ok to torture foxes legally up to that point), have been used (and are probably still being used) under a bait to trap golden eagles, wild cats and foxes.. The most likely trap to have been involved in the recent golden eagle case. Eagles are strong enough to rip one of these up and fly or hobble away…if stake isn’t well tied down. They can snap bailer twine (the usual attachment for Fenn/Springer pole traps) like it was thread”. In light of this week’s test court case about whether it’s legal to snare mountain hares (the Lochindorb Estate trial), a contributor has sent in this topical photograph. 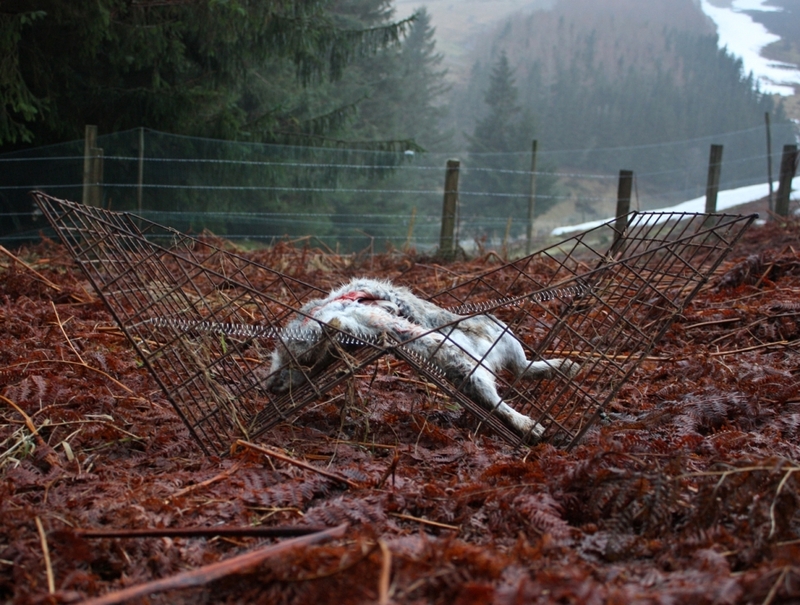 It shows a decomposing mountain hare that had been caught in a snare on another well-known grouse moor and left to rot. In Scotland, it is a legal requirement for snare operators to check each of their snares at least once a day at intervals of no more than 24 hours. It is an offence to fail to release or remove an animal, whether alive or dead, while carrying out such an inspection. It is clear that an offence had been committed in this instance. The contributor says the recent incident was reported to the police, who initially failed to respond. When a follow-up request was made, and cc’d to the local MSP, the police did respond and claimed they then visited the estate, armed with a grid reference, but couldn’t find the corpse. A police investigation into alleged hare snaring on the estate was not forthcoming. The snaring legislation in Scotland has been recently updated, bringing in new requirements for snare-operator training & accreditation, snare-operator ID tags to be fitted to snares, and record keeping for every single set snare. GWCT has produced a snaring guide (2012) that provides detailed information for snaring in different parts of the UK – see here. OneKind has it’s own view on the adequacy of the snare-training courses on offer – see here. Photo: clam trap – why haven’t these been banned? This is a photograph of a clam trap, also known as a snapper trap, butterfly trap and Larsen mate trap. They are used to trap corvids, although obviously the traps are indiscriminate and can also be used to catch raptors and other protected species. We’ve recently blogged about clam traps and the controversy over whether they are a legal or an illegal trap (see here). The clam trap photographed here shows a slight variation of use. Usually the trap will be held open by a false perch that collapses when weight is applied (e.g. when a bird lands on it) which causes the trap to snap shut. In this photo the false perch is absent and instead, the trap is set to snap shut when weight is applied to the base (e.g. when a bird lands on the bait). It’s quite incredible that SNH has not yet banned the use of these traps on welfare grounds. Just look at the photograph. Imagine if a large raptor (e.g. buzzard, kite, goshawk, eagle) is caught in one of these things. Apart from the injuries that could be caused to the bird when the trap snaps shut (they are designed to shut with speed and force so it’s highly probable that the bird’s wings will still be open and thus caught in the jaws of the trap as it snaps shut), the trapped bird then has to endure up to 24 hours inside this cage before it is checked by the trap operator. Would it be able to move inside the trap? Does it have a perch? Does it have water? Does it have shelter? All these are basic requirements covering the use of crow cage traps and Larsen traps where a decoy bird is in use. Why should a clam trap be exempt from these welfare requirements? Is it because there isn’t a decoy bird in use? What about the welfare requirements of the trapped bird, whether it be a target or a non-target species? It’s probably fair to say that it would be stressful for any large raptor to be caught inside one of these things, whether it’s injured or not, and to be trapped like that for up to 24 hours? That’s assuming the trap operator bothers to do the 24 hour check. In our view it fails on all welfare considerations. The general licences used to permit the use of crow traps also explicitly ‘do not permit the use of any form of spring-over trap’. What’s this then if it isn’t a form of spring-over trap? Some organisations have argued that it isn’t a form of spring-over trap…no prizes for guessing who that was. Unsurprisingly, the Scottish Gamekeepers’ Association supports the use of these traps (see here and here) as does Scottish Land and Estates [formerly known as SRPBA] (see here). Whilst we all wait for SNH to make a decision on the legality of clam traps….if you see one of these traps you are advised to report it immediately to the police, SSPCA and RSPB. As with the other crow cage traps, the clam trap should have an identification code attached along with the telephone number of the local Police Wildlife Crime Officer. See here for a discussion on the legalities of other crow cage traps and what to do when you find one. Red kites have also been known to do it, funnily enough on another Scottish sporting estate. First they removed their wing tags, placed them in a hole and then covered the hole with moss. Then they severed their own legs, placed those in holes and also covered the holes in moss. Remarkable.